The main missions of the Bureau of Geotechnology are the applications of airborne geophysics, remote sensing and geochemistry data to support geological resources and engineering geological works and managing the database and data processing for all geoinformation. 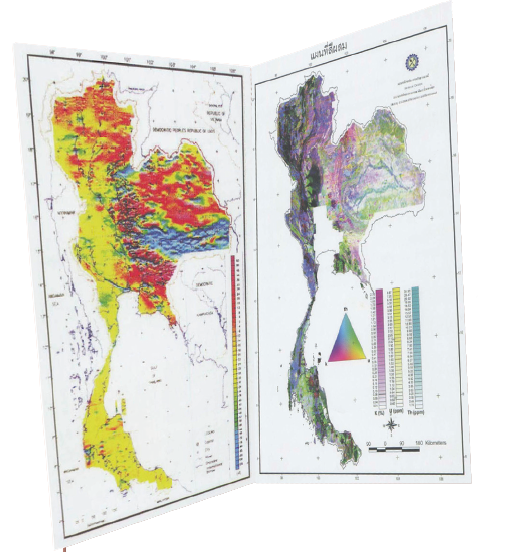 The main missions of the Bureau of Geotechnology are the applications of airborne geophysics, remote sensing and geochemistry data to support geological resources and engineering geological works and managing the database and data processing for all geoinformation.Remote sensing data processing is regulary prepared for the DMRs routine geological, geophysical and other geotechnical suyvers, carried out to support geological resources and engineering geological works. 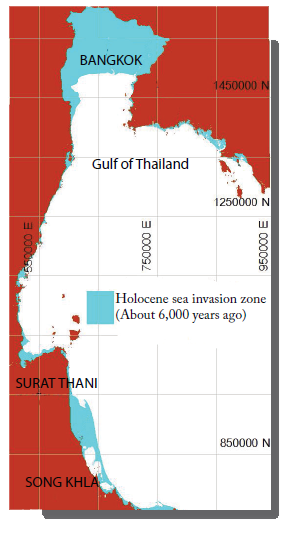 The main missions of the Bureau of Geotechnology are the applications of airborne geophysics, remote sensing and geochemistry data to support geological resources and engineering geological works and managing the database and data processing for all geoinformation.The Ancient map of the Gulf of Thailand shows seawater invasion about 70 km. from the present position. After the end of the last Ice Age, the sea level was about 4-5 meters higher than the present level. DMR conducted nationwide airborne geophysical surveys between 1984 and 1988 in order to provide essential basic geoscientific data for mineral resources development and geologically related projects and activities. The surveys included magnetic, radiometric and VLFEM, and frequencydomain electromagnetic surveys over five selected areas. The ground geophysics surveys are regularly applied to reveal the underground problems in many geological explorations, e.g., engineering geology, environmental geology, geohazards and mineral resources explorations. The most frequently applied geophysical methods are Magnetic, Gravity, Ground Penetrating Radar and Electrical Resistivity. The DMRs drilling teams are equipped with heavy machinery, and are prepared to support the exploration of geological resources and solving of geohazard and engineering problems. DMR carries out research on the development and rehabilitation of abandoned mines, geological conservation sites and geohazard affected areas.